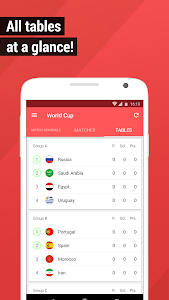 The fastest app for live scores and fixtures for the world cup in 2018! 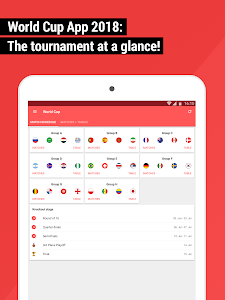 See the full schedule for the tournament in one easy-to-use app. 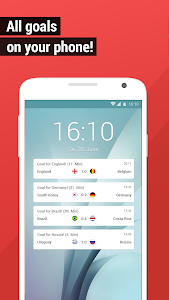 Activate the GoalAlert and get push notifications in real-time whenever a team scores. You can adjust your favorite teams in the settings (For example you can choose to only enable England national football team). 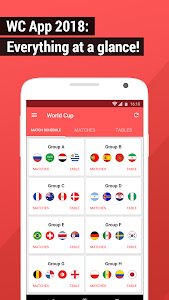 A super-fast table for every group is available. 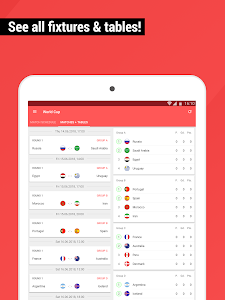 All World Cup matches can be viewed in the app. So you can find out which matches are next or how the past matches ended. We are user-friendly and therefore focus on the most important information. In addition to the live scores, you will also find other practical features such as the line-up, goal scorers and interesting live statistics. 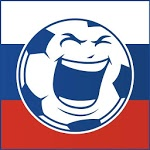 We hope you will enjoy the world cup in Russia, no matter what team you are supporting! 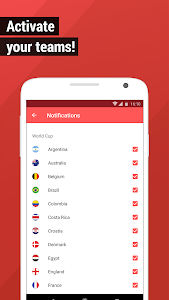 The GoalAlert world cup app is easy to handle and faster than other liver ticker and news apps. We appreciate your feedback. You can send suggestions or issues wit the app via the support section in the settings or via [email protected] to us. Improvements for World Cup in 2018! 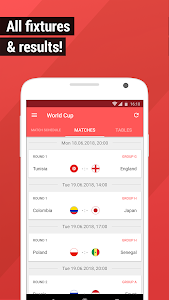 Similar to "World Cup App 2018 - Live Scores & Fixtures"